WARNING: Spoilers ahead for Shatter Me by Tahereh Mafi. Juliette and Adam have escaped to Omega Point, a rebel headquarters where there are many other people with abilities who are training to fight the Reestablishment. Juliette has to try to integrate herself into life at Omega Point, but is still fearful of her own power. She thought she was finally free from the Reestablishment and their plans for her, but when she finds out that Warner is still searching for her, she realizes that what she thought was over is only just beginning. This was such a great sequel. I love every character in these books, but I’d have to say Kenji was one of my favorites in this one. Juliette starts off in Unravel Me by being super mopey, upset that people don’t talk to her and that Adam seems to be hiding something from her, and finally Kenji calls her out on it. She begins to realize that only she can make a change in the way people see her, and she starts to grow stronger and learn to use her ability for good rather than fear it. But seriously, I went from liking Adam in Shatter Me to wanting to throw him across the room in Unravel Me. He became such a whiny baby in this book, and every moment with him was like a soap opera. When Warner finally came back into the picture, I was so happy because even though he had seemed like a bit of a monster, his character was so much stronger and intriguing than Adam, who was just draining. And speaking of Warner. CHAPTER SIXTY-TWO. Oh my goodness. I was leaning towards “Team Warner” before this but that chapter definitely sold me there. Enough said. What I really loved most about this book was the growth that Juliette showed from beginning to end. Like I said before, she starts off very emotional and depressed, and when Kenji kind of slaps her in the face with honestly midway through the book, she starts to become stronger both emotionally and physically. By the end of the book, she is such a strong person that it is hard to even remember how depressed and down on herself she was in Shatter Me. Overall, Unravel Me was an excellent sequel that really solidified my love for this series. Juliette is quickly turning into one of my favorite female protagonists, and I literally had to download the final book thirty seconds after finishing this one because it was just that good. 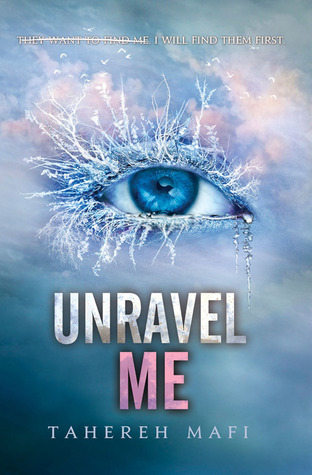 Unravel Me was released on February 5, 2013 and is the second book in the Shatter Me series.